The Federal Aviation Administration (FAA) recently issued a final rule to regulate the commercial use of small unmanned aircraft or drones. Some of the requirements of the final rule could preclude the use of drones for the efficient monitoring and inspection of remote and linear energy facilities such as transmission lines, pipelines and hydroelectric facilities. Congress, however, has instructed the FAA to develop procedures to exempt from those requirements the use of drones for monitoring and inspection of critical infrastructure. This Alert provides an overview of the requirements with which drone operators must comply in order to legally operate a drone. It also provides a brief explanation of the steps that utilities, pipelines and their contractors must take in order to operate drones for monitoring and inspection operations on critical infrastructure facilities. The FAA Modernization and Reform Act of 2012 directed FAA to develop a comprehensive plan to integrate the use of drones into the national airspace and to develop regulations to implement that plan. Accordingly, on June 28, 2016, the FAA issued the “Small Unmanned Aircraft Rule” to allow for routine civil operation of small drones for non-recreational purposes and to establish a comprehensive set of rules for those operations. This rule, which becomes effective on August 29, 2016, adds a new Part 107 to Title 14 of the Code of Federal Regulations and replaces existing FAA regulations related to airworthiness, airman certification and operating limits. may be operated only during daylight or twilight (within 30 minutes of sunrise or sunset) hours. Fast on the heels of this rulemaking, the FAA Extension, Safety, and Security Act of 2016 was passed by the Congress and signed into law on July 15. Section 2210 of this Act requires the FAA to establish an application process for the use of drones for monitoring, surveying and inspection of critical infrastructure facilities during the day or at night and beyond the line-of-sight of the individual operating the drone. Critical infrastructure facilities include oil and gas production, storage, transportation, and delivery systems; electric generation, transmission, and distribution facilities; water supply systems; telecommunications networks; and transportation systems and services. Drone uses that are permitted under Section 2210 include activities to ensure compliance with Federal or State regulatory, permit, or other requirements; activities to inspect, repair, construct, maintain, or protect critical infrastructure facilities, including for the purpose of responding to an incident; and, activities in response to or in preparation for a natural disaster, manmade disaster, severe weather event, or other incident beyond the control of the applicant. In addition, Section 2210 specifically authorizes the use of drones at night and beyond the visual line of sight of the remote pilot. demonstrate that it is in compliance with the remainder of the requirements of Part 107. These requirements include rules for aircraft maintenance and inspection; operating limitations relating to types of airspace, awareness of prohibited areas, speed, altitude, visibility, and location of persons and property; emergency procedures, contingency procedures, and consideration of potential hazards; and reporting requirements for deviation from the rules of part 107 in the event of emergency. After acquiring authorization to operate a drone, the applicant will need to ensure that it has systems in place to ensure continuing compliance with these requirements. establish an internal system to ensure and demonstrate that the registered drone will be and is being operated in a manner that complies with the requirements of Part 107. The professionals at Van Ness Feldman, LLP are available to assist clients in preparing for and implementing the components of these two steps. 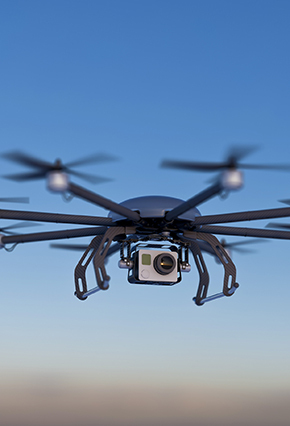 Van Ness Feldman is available to assist clients in understanding the implications of the FAA’s final rule to regulate the commercial use of drones for monitoring energy infrastructure. For more information, please contact Tom Roberts, Bryn Karaus, or Darshana Singh at 202-298-1800. The final rule is applicable to “small unmanned aircraft systems”. In this Alert, we use the more common term “drone” to refer to the small unmanned aircraft subject to the final rule. Operation and Certification of Small Unmanned Aircraft Systems, 81 Fed. Reg. 42,064 (June 28, 2016) (to be codified at 14 C.F.R. pts. 21, 43, 61, 91, 101, 109, 119, 133, and 183). FAA Extension, Safety, and Security Act of 2016, Pub. L. No. 114-190, 130 Stat. 615.